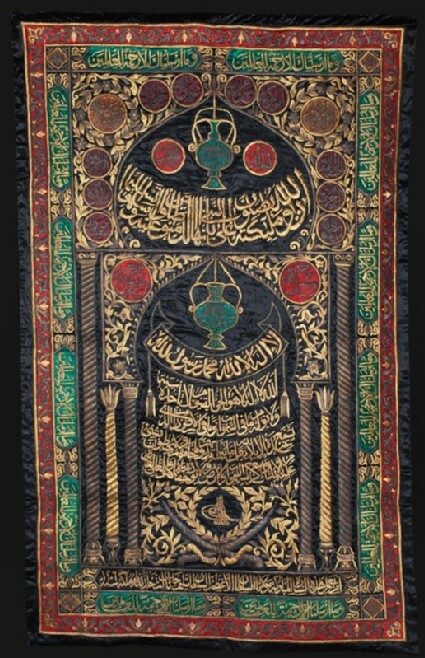 Embroidered textiles were amongst the most impressive gifts presented during the processions associated with the annual Islamic pilgrimage (hajj) to Mecca. Traditionally produced every year by the Muslim rulers who controlled the holy sites of Mecca and Medina, these costly objects were at once expressions of wealth and piety. 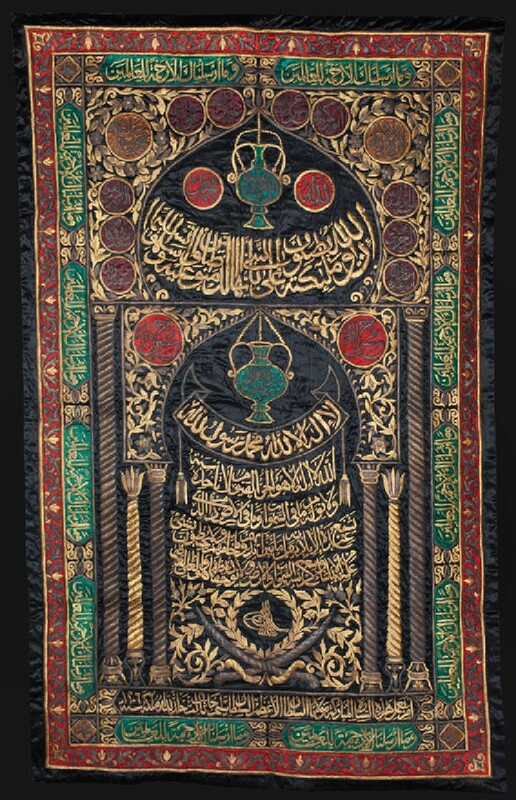 This curtain or sitarah was made for the mosque of the Prophet Muhammad (died AD 632) in Medina and was probably meant to be displayed near his tomb or by the mosque’s mihrab, the niche indicating the direction of prayer. The main design is also based on a prayer niche, which is adorned with a mosque lamp inscribed with the Qur’anic verse ‘God is the light of the Heavens and Earth’ (surat al-Nur, 29:35). Beneath it lines of bold inscriptions feature the shahada (Muslim profession of faith) and the ayat al-kursi (‘throne verse,’ surat al-Baqara, 2:255). An arch with mosque lamp and a further Qur’anic quotation (surat al-Ahzab, 23:56) are also found in the upper tier of the textile, surrounded by medallions that contain the names of Allah, Muhammad, and the four orthodox caliphs among others. 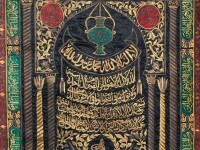 The curtain was commissioned by the Ottoman sultan Selim III (ruled 1789-1807), whose imperial monogram (tughra) lies at the centre of the wreath located between two crossed swords at the base of the arch. An inscription underneath it further confirms the attribution and also records the date of production, AH 1206 (AD 1791-1792). Presented by Nasser D. Khalili and Family, 2012.